Portuguesa State (Spanish: Estado Portuguesa, [esˈtaðo portuˈɣesa]) is one of the 23 states of Venezuela. Located in the west of the Republic, it is considered the "breadbasket of Venezuela" for the large amount of agricultural products produced there. The state is bordered on the north by the state of Lara, on the east by Cojedes, on the west by Trujillo and south by Barinas. As of the 2011 census, it had a population of 876,496. The state government is located in the city of Guanare, founded in 1591. It is located in the Midwestern Region of the country, extending approximately between latitudes 08°06′ and 09°50′ north latitude, and meridians 68°30′ and 70°11′ west longitude. It has an area of 15,200 km² representing 1.67% of the national territory. The dominant vegetation is savanna, but are also gallery forests along the river bends, and dense forests in the foothills of the Andes. There are abundant hardwoods which are a major income source, represented by the dwarf oak, mahogany, eucalyptus, teak and pine. The fauna is represented by: spectacled bears, jaguars, (both endangered species), armadillos, parrots, opossums, howler monkeys, deer, ocelots, pumas and southern tamandua. There are birds like the crested curassow, hummingbird, great kiskadee and cardinal. One of the largest species of moth in the world can be found: the thysania agrippina, with wingspan of 30.5 cm. By 2001 the state had a population of 873,375 inhabitants, representing 3.34% of the national total. It has a growth rate of 2.1% per year, and a density of 57.5 inhabitants per km². According to the estimate for 2012 the state population is 1,056,000 inhabitants, of whom 517,780 were female and 538,243 male. Acarigua city in the north, is the largest conurbation in the state, being the second largest in the center-west of the country, along with Araure form an area with over 460,000 inhabitants (2001 Census). The state capital, Guanare, in recent years has grown at a rapid pace, at present estimated population is over 200,000 just in the town itself. Due to its recent momentum Portuguesa State has become a major recipient of migrants from other regions of the country. The state's name comes from the Portuguesa River, which crosses the state. Legend has it that the name originated from a woman originally from Portugal who drowned in its waters. Diego Ruiz de Vallejo and Juan de Villegas in 1549 began exploring the land in the east of the Andes. 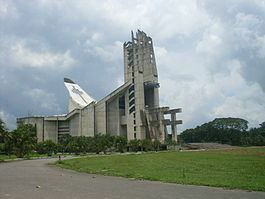 Years later, on November 3, 1591 Juan Fernandez de Leon founded Holy Spirit Guanaguanare Valley, Guanare today. Its name in the indigenous language means 'Place of seagulls' and also, 'land between the rivers'. On April 10, 1851, by decree of the Congress under the leadership of José Gregorio Monagas, the territory that now forms Portuguesa State became a province, with its capital Guanare. Subsequently, following the Federal Revolution in 1866, he decided to join Zamora and Portuguesa institutions in one state and call Zamora. Later, Antonio Guzmán Blanco in power, territorial division was reduced to seven states, so Portuguesa State became part of South West, along with Cojedes and Zamora. In the late nineteenth century, the Restorative Revolution returned to the country's political divisions in 20 states and, consequently, Portuguesa and Cojedes were again Zamora. Finally, on August 5, 1909 was enacted the Constitution, which stated that Venezuela would be made by a Federal District, two federal territories and 20 states, one of which would be Portuguesa. The current state capital has been called the 'Athens of the plain', by their tendency to accommodate cultural centers, museums and cultural centers in general. Like most of the plains states, Portuguesa was virtually cut off from the center of the country until mid-twentieth century. The only way to move from this entity to another was using carts pulled by horses or oxen, or using waterways. It was in the 40s, when work began on the road to Los Llanos, which meant the region's economic takeoff. The plan incorporating rice and hundreds of hectares of agricultural land were key to the development and growth of this state. The main economic activity in Portugesa State is agriculture: crop farming as well as livestock. Recently tourism as well as oil exploration are gaining momentum.